NEW! DRAGON & LOTUS 4 in. x 3 3/4 inches wide. (A version of): DRAGON & LOTUS: With more than 100 years having passed into history, changes and alterations become inevitable. Apparently the new owner of this old mould decided to take some drastic steps in opposition to what “went before”! We can only say that when this new and curious element was discovered in Oct. 2013 during a convention, collectors knew that the FC did NOT refer to FENTON CORPORATION! (smile). 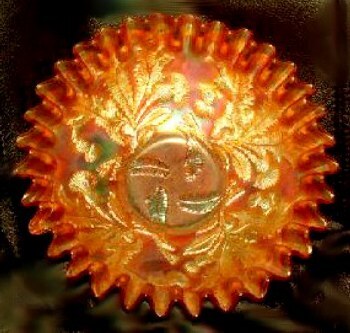 The “crown” might possibly designate a “crowning blow” to what was a best seller during the long years of Fenton production in carnival glass. 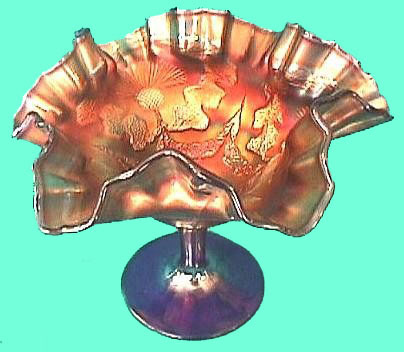 History relates: Frank L. Fenton was an admirer of oriental designs. Marigold over Vaseline - DRAGON & LOTUS - Very Scarce! DRAGON & LOTUS: These vaseline examples can be ruffled or ice cream shaped. Only six bowls in vaseline have sold in recent years at auction. No plates are known in vaseline. When compared with the NEW tri-corner version, the eye will note a dramatic reduction in clarity and detail of the pattern! Marigold iridization does not extend to the edge. Feb. 1911 Butler Bros. 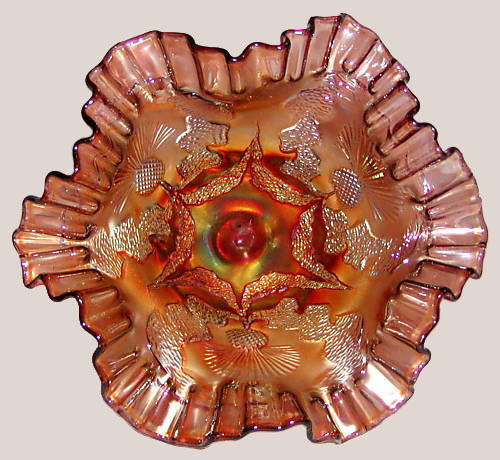 Catalog Ad (Thistle Bowl). 8.25 in. 3-1 edge Marigold bowl and an Aqua 8-ruffle bowl - THISTLE. 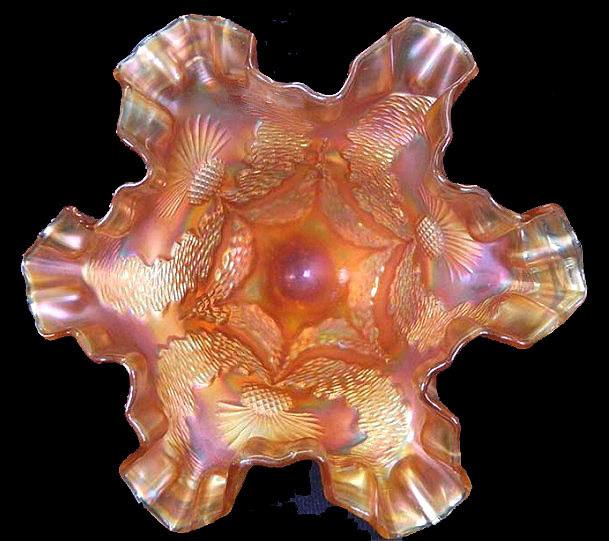 Marigold THISTLE bowl of only 7.5 inches. Tight CRE is somewhat unusual for this 9 in. bowl. THISTLE 9 inch plate - Green - Sold for $3600. Marigold sold for $1500. - 11-12 at Seeck Auction. 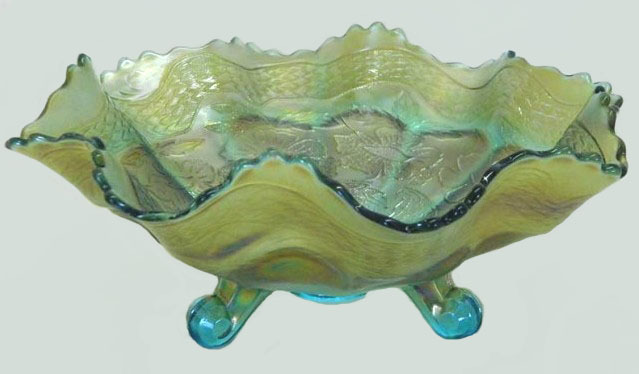 THISTLE: These 8”-9” bowls are found having ruffled, 3/1, and candy ribbon edge. 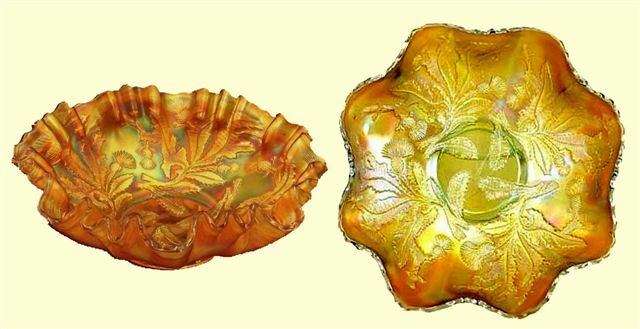 Marigold, green, blue, amethyst, and amber are not too difficult to locate. Vaseline and aqua examples are rarely found. 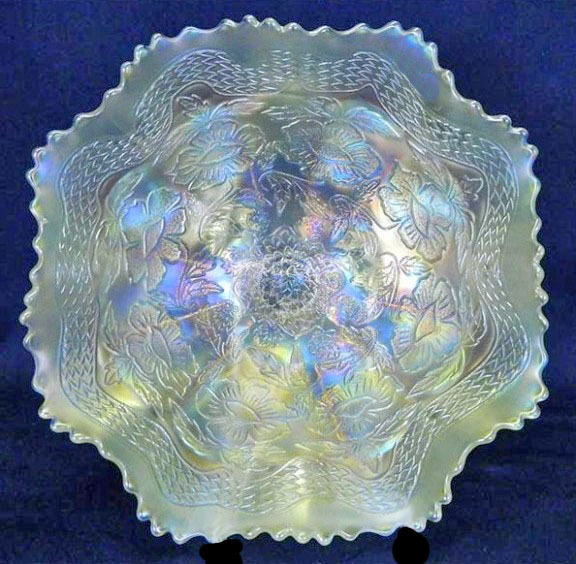 Some amethyst and green bowls offer Horlacher advertising on the base. 9” plates will sell for several thousand dollars. Amethyst, green and marigold are known colors. (A version of): THISTLE: Nothing looking like this ever left the Fenton Factory!...........It obviously is an “overly flattened” former bowl! Deception is the name of that game! SCOTCH THISTLE Compote in Cobalt Blue. SCOTCH THISTLE 5.5 in. Amethyst Compote. SCOTCH THISTLE Compote in Marigold. 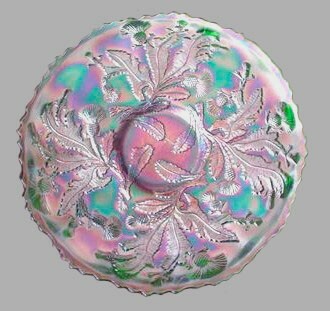 SCOTCH THISTLE: Amethyst, blue, green and marigold are known colors in this very scarce compote. Some years pass without an example having appeared at auction. The exterior has no design. This design is not like that seen on the bowls and plates having the same name. White 11 in. TWO FLOWERS footed bowl. TWO FLOWERS - Aqua, 10 in.-11 in. ball footed bowl. Then he said to me, “These words are faithful and true”. I fell down to worship before the feet of the angel who showed me these things.